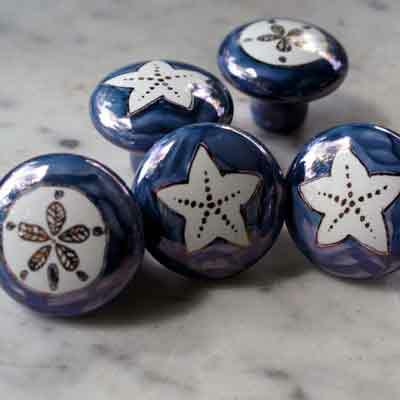 I have been painting porcelain cabinet knobs, fan pulls and switch plates since 1996 and offer both my designs as well as custom projects. If you don't see a suitable design please contact me and we can discuss your requirements. I am limited, somewhat, to the glaze colors that exist but can usually find at least a compliment. My over glaze process is very unique and the designs look like small water colors. The glazes are fired in my kiln and produce a very durable surface. Clean with soap and water (no abrasives please). If you live in the Atlanta Georgia area, you can see all my designs at many local art shows. I also have an Etsy site 'TinyBrushes' where I list Christmas ornaments and other items.